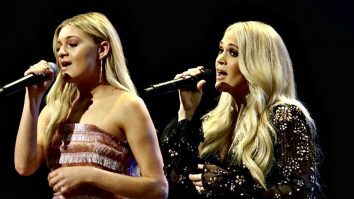 Country music won big time at the 2019 Grammy Awards. Kacey Musgraves took home the night’s biggest honor, winning the all-genre Album of the Year award for her critically acclaimed record, Golden Hour. The album previously won the CMA Award for Album of the Year in November. Despite that, and the fact that it won the Best Country Album award on Grammys night, Musgraves was not expecting her Album of the Year win. 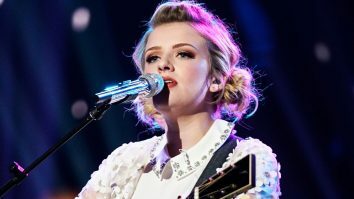 Many of country’s hottest stars also won big in the country/Americana categories, with Musgraves winning Best Country Solo Performance and Best Country Song, Dan + Shay winning Best Country Duo/Group Performance, and Brandi Carlile taking home the trophies in multiple Americana categories. 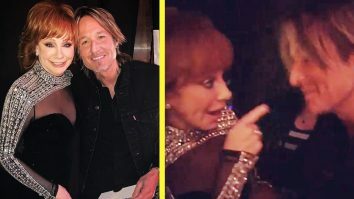 But the award categories weren’t the only things that country stars were winning at the 2019 Grammys. 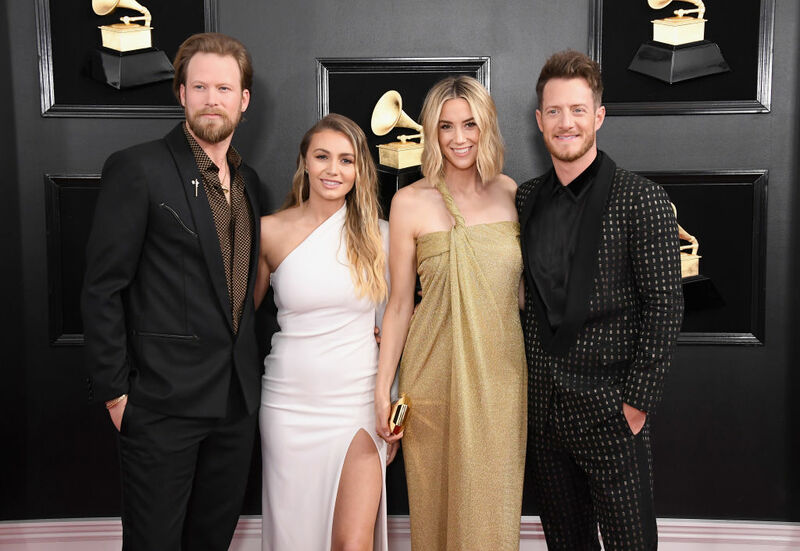 They were also ruling the red carpet, with many country artists and their significant being hailed as some of the best-dressed attendees of the night. You never know what to expect when Tyler Hubbard and Brian Kelley of Florida Georgia Line hit a red carpet. Sometimes they op for a more casual look, while other times they do a mix of casual/formal with fun accessories. But when they walked out on the Grammys red carpet the look they went for was sleek and “Simple.” Their wives Hayley and Brittney, also looked stunning in their gowns, which each featured a one-shoulder sleeve/strap. As for Hayley, she confessed in a red carpet interview that her gown was strategically pinned to hide something…a baby bump! 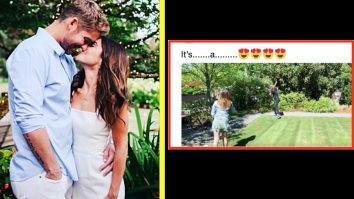 She and Tyler announced they are expecting their second child at a Grammys pre-party, but hadn’t been sure before then if they’d be sharing the news before the Grammys or not. Hayley wasn’t the only pregnant member of the country music community at the Grammys. Country singer and Best New Artist nominee Margo Price is currently expecting her third child, and had her baby bump on full display while walking the Grammys red carpet. She took the “red” part of red carpet literally, and donned a bright red gown with a long, ruffled train and sequined star details on the front. Every little accessory, from her red heels to her eye-catching earrings, matched perfectly! 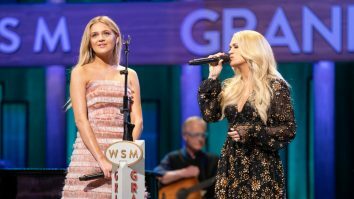 Maren Morris is one of the most popular artists in country music right now, and was also one of the most-nominated artists at the 2019 Grammys! She had a total of five nominations in both country and pop categories. Although she didn’t win any of the awards she was nominated for, Morris definitely won the red carpet. Her flowing, whimsical gown featured a long cape-like piece of fabric that draped off of one shoulder, which was also covered in a bright yellow flower. The floral theme continued over the rest of the blush-colored gown, and was simply enchanting to see. On top of being the night’s big winner, Musgraves was also a winner on the red carpet. Like Morris, she showed some love to a light pink hue, choosing a gown that was almost entirely blush-colored with the exception of a brighter pink sash around her waist. The tulle gown featured an off-the-shoulder neckline, and delicately fanned out near the top. It reminded us of the fan Musgraves is holding on the cover of Golden Hour! Up for two awards in the Americana categories, country music icon Lee Ann Womack was one of the standout figures on the red carpet. She embraced a timeless look with her ensemble, which featured a black skirt, cream-colored top, and sparkly pink ribbon around her waist. Other parts of her outfit were just as dazzling, including the rhinestone detail along her neckline and the gorgeous drop earrings she used to accessorize the look. Kelsea Ballerini‘s sophomore album Unapologetically was nominated for Best Country Album, a huge honor! Based on the unshakeable smile she sported on the red carpet, she was quite excited about what the night had in store for her. That smile was perfectly accented by bright red lipstick, the one bold color that Ballerini embraced as part of her look. As for her dress, she opted for something with a subtle amount of sparkle and a color that nearly matched her skin tone. It was such a sweet look, and she was lovely in it! 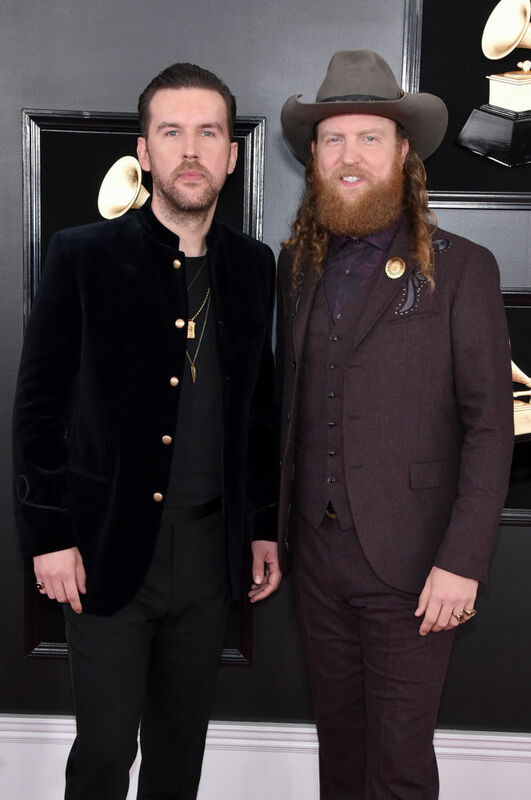 Oftentimes the ladies get all the love when it comes to best-dressed lists…but the Brothers Osborne fellas were looking too good to ignore! Brothers T.J. and John looked downright dashing in their suits, which they both accented with metallic gold jewelry. One brother wore a set of gold necklaces, while the other sported a circular gold pin on the side of his jacket. They proved that sometimes simplicity is key for creating a cool red carpet look! 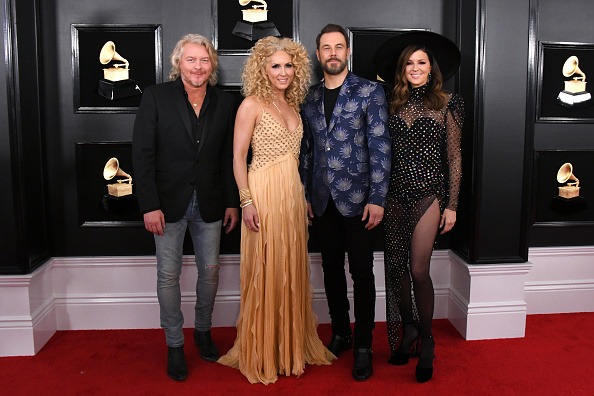 The members of Little Big Town are no strangers to awards show red carpets by now. As one of the most well-respected groups in all of music, the talented quartet has the chance to show off some incredible fashions at all sorts of events. Sometimes the members will match each other down to every last details. Other times the ladies will match each other and the guys will do their own thing. And then there’s the times when they all take their fashion choices in different directions, which is what they did at this year’s Grammy Awards! Our eyes immediately darted to Kimberly Schlapman, who, like many of her fellow country stars, was sporting a lighter-toned dress with ruffles. The top featured a fun metallic detail, and she complemented the look with a matching floral clip in her hair. 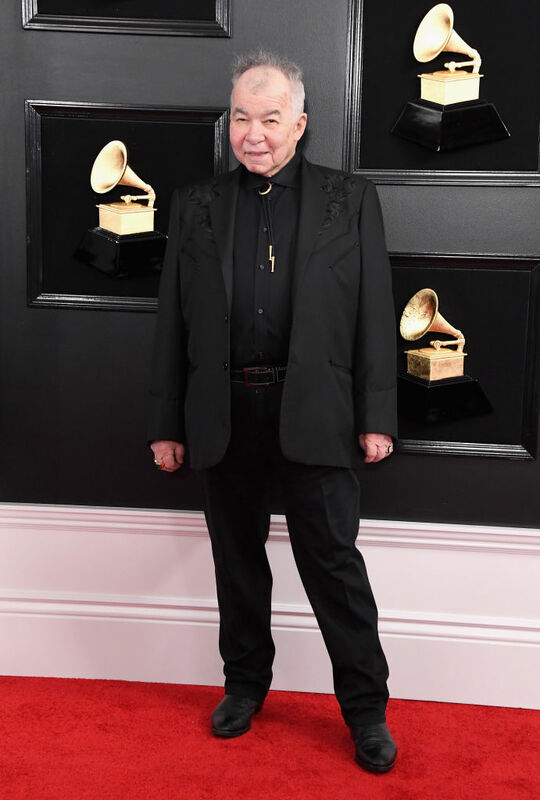 Country music legend John Prine was also a legendary figure when it comes to fashion on the Grammys red carpet this year. He kept things classic with his look, opting for an all-black ensemble that would have made Johnny Cash proud. The best part of his look? The bolo tie! Brandi Carlile was another one of the night’s big winners, taking home a total of three awards out of a total of six nominations. She also won the red carpet with her getup, which appealed to a style country stars have been sporting for decades. Looking at the embroidered details on Carlile’s suit, you can’t help but think of the famous Nudie Suits that have been part of country music culture for so many years. We appreciate her effort toward keeping things classic! Speaking of classic, what Grammys red carpet best-dressed list would be complete without Dolly Parton? As a performer and the recipient of the prestigious MusiCares Person of the Year award, Parton was the woman of the hour at the 2019 Grammy Awards. And she dressed the part…donning an elaborate, glittery red dress accented with large gems. It was over-the-top and fabulous, just as we’ve come to expect from Parton over the years! But Parton’s red carpet look wasn’t the only outstanding outfit she wore that night. When she performed later in the evening she changed into an elegant white dress with sheer, flowing sleeves and a body covered in lace and floral details. You can appreciate the beauty of that dress by watching her performance below! 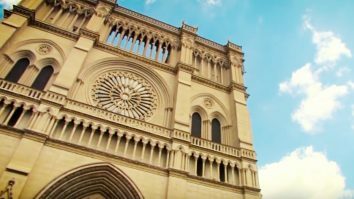 What do y’all think of this best-dressed list? Which star sported your favorite look?